Bodyboarding is one of the most exciting sports ever invented. While initially unaccepted by the wave riding community, bodyboarders have now established themselves as one of the craziest and skillful water sports enthusiasts. While many people think that bodyboarding is an introduction to surfing, that can’t be further from the truth. As a matter of fact, it is a very technical water sport – your entire body is close to the water, and your face is almost touching the ocean. If you’re looking to get into bodyboarding, you’re in for one hell of a ride. However, in order to do so, you first need to visit a water sport equipment store to get your first bodyboard. Alternatively, you can find bodyboards and other pieces of water sport equipment online. Regardless of where you decide to shop from, there are a few important factors to consider. First and foremost, you need to consider its size. In order to get an appropriate bodyboard for your size, you need to consider your height and weight. 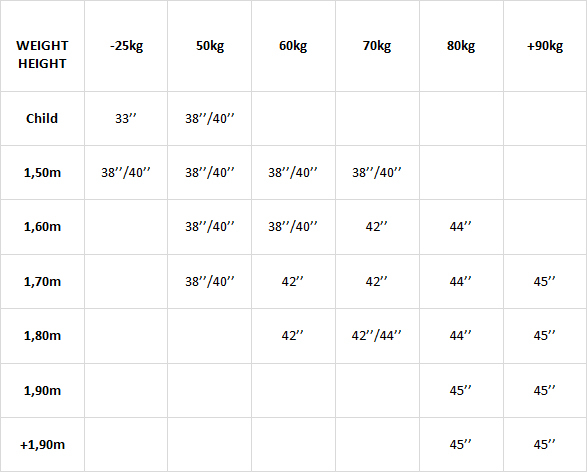 Here’s a chart that will help you determine the ideal bodyboard size for you. Then, you need to consider the materials the board is made of. Generally, the core of most boards is made of either polypropylene or polyethylene. Polyethylene is more flexible and heavier, which means it is ideal for riding bigger waves in colder waters. However, if damaged, it will absorb water over time. On the other hand, polypropylene is lighter, stiffer, more durable and 100% waterproof, making it ideal for riding smaller, choppier waves in warm water. Both types come in different grades of consistency strength and quality, which is typically reflected in the price. Furthermore, you need to consider the slick materials. The slick is the downward-facing part of the bodyboard which is covered in a slippery covering, giving the bodyboard speed and strength. Generally, this part is made of surlyn, high-density propylene, and low or high-density polyethylene. Surlyn is flexible and responsive, ideal for experienced riders. High-density polypropylene is harder, stiffer and thicker and has low flex, making it ideal for beginner riders. Low or high-density polyethylene is similar to high-density polypropylene. And lastly, you need to consider some of the extra accessories that you’ll probably need with the bodyboard, such as swim fins. Swim fins, while not mandatory, are an invaluable addition that will help you pad out long water distances. Open-heeled fins are the preferred option among bodyboarders. Also, consider buying a leash that has a strong ankle, bicep or wrist attachment, so that you don’t end up losing your board.